The process of transition doesn’t end when a site moves to GOV.UK, in fact the days after switch-over are crucial. People use the Transition Tool for different tasks before and after a site moves. Before transition, it’s all about publishing new pages and mapping old URLs to them to make sure all of a site’s URLs continue to work. After transition, the Transition Tool generates analytics so we can identify and fix any missing mappings and look at how redirects and archive links are performing. One of the design principles behind GOV.UK is to design with data and the process of transition is no exception. The metrics we gather after a site moves to GOV.UK means we can make sure users continue to see the pages they need, vitally important given the nature of, and audience for,government information. Missing mappings or irrelevant redirects mean frustrated users. More worrying, mistakes in transition can cause serious consequences for individuals and businesses if information is incorrect or simply disappears. The Transition Tool has been designed specifically to stop this from happening and correct any mistakes straight away. Mapping is not always an exact science and over time data can show you where to make adjustments to meet the needs of users. You might have missed mappings or mistakenly archived pages. The Transition Tool provides safeguards to make sure that all requests for old URLs are served properly. We built an analytics section for each site so they can see all the traffic requesting URLs on the old domain. 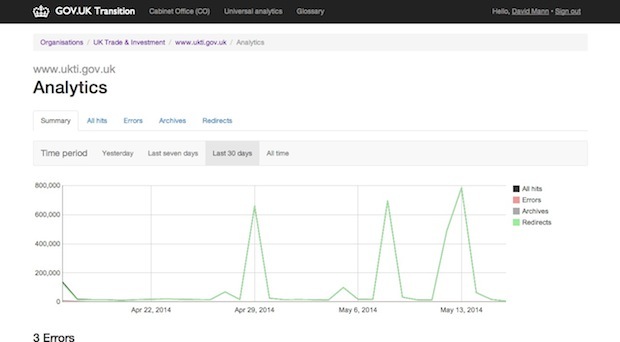 Above is the main summary traffic graph for UKTI, which moved to GOV.UK in April. The graph shows all the traffic to the www.ukti.gov.uk domain and is colour coded. Green shows successful redirects and as you can see, the error level for UKTI is tiny so there is barely a red line on the graph. A grey line would show links to archive pages. You can filter by different time periods so you can see traffic for one day, a week or 30 days before. The ‘All time’ view shows all the information we have for a site. Because we had some web server logs from UKTI, we can see some of the traffic before transition. The screen below shows the last seven days. As well as the graph, the summary screen also shows the top 10 errors. An error has the status code 404 and it means that there is no mapping for that particular URL. The view above shows the top 10 errors over 30 days for a transitioned site. The list is in order of traffic from high to low so you can fix the more popular pages first. It’s simple to add mappings for any old URLs, use the ‘Add mapping’ button on the right. If you want to work through the full list of missing mappings, ‘See all errors’ shows you the full list of missing mappings. At the top of the screen you’ll see a graph displaying the last 30 days. You can change the time period to display that set of data on the graph. If you mouse over the red line, you will see the date and number of errors on that day. In the example above, there is a traffic spike on May 11 so if you click on the graph you can view the report for that day. Again, the list is displayed in traffic order so you can fix the high volume errors first. To work through the full list of errors, a good starting point is to set the time period to ‘Last 30 days’ and work down the list. In the weeks after transition, it’s vital that all errors are fixed straight away so users are not confronted with error pages caused by broken links. It’s worth continuing to monitor errors as it’s possible that they will continue to be generated months and even years after a site moves. A common issue on error screens are old RSS feeds that haven’t been redirected. Users might type in an incorrect URL or there might be links on other sites containing typos. If appropriate these can be mapped to the intended URL on GOV.UK. Some errors are simply errors, like URLs that didn’t exist in the first place, so you can use your judgement here and leave them without mappings. 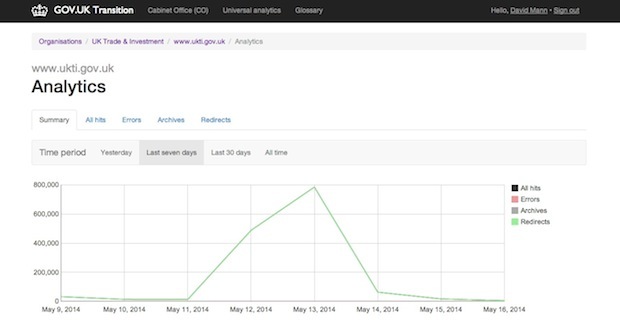 Analytics tells you how many people are seeing archive links on GOV.UK. If lots of users are requesting an item from the archive, it suggests a potential user need that should be met on GOV.UK. The archive section works in exactly the same way as the errors, which is outlined above. You can use the graph to investigate spikes or work through the full list filtered by time period. If you publish new pages on GOV.UK, you can edit the archive mappings and turn them into redirects. Over time after a site transitions, we expect to see traffic start to tail off to the old domain. However, the nature of government content is that there are so many links in the wild that this can take a long time. There are still paper forms and leaflets in circulation with old website links and it will be years before they all disappear. It’s really important to keep using the Transition Tool. Given the seasonal nature of some government content, some links to old pages may lie dormant at the time of transition and may have been missed. These will filter through to the traffic analytics. The Transition Tool is not the only source of data you can use to evaluate the performance of your mappings. You can use search data from GOV.UK to help you connect the dots. In a recent example from a newly transitioned site, users were arriving on a browse page and searching for something specific from that page that they were expecting to find. This would suggest either the mapping needed to be adjusted or that the user need was not adequately met by that page. For more information about how we use data to test the performance of transition, talk to your transition manager. Also, check back here on the Transition blog for more posts on the mechanics of transition.